Stoner SS1 Shine & Sealant is a super concentrated, quick foaming, silicone-free, clear coat sealant that provides outstanding shine and facilitates spot-free drying on all vehicle surfaces. Rapid beading action ensures maximum water removal. Stoner SS1 is designed to maintain and preserve clear coat surfaces and help protect all modern finishes from harmful ultraviolet rays. 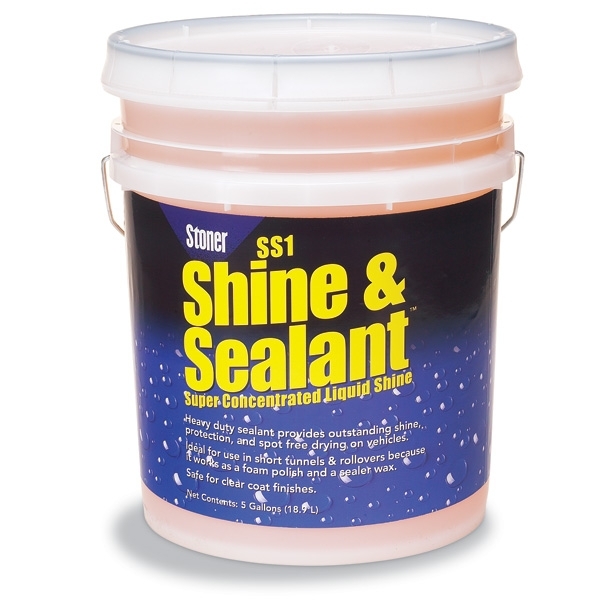 Ideal for use in short tunnels & rollovers because it works as a foam polish and a sealer wax. Stoner SS1 provides a long lasting, high gloss appearance and a protective coating that will not smear or streak glass surfaces. Produces a temporary, thin white sheet of suds which dissipates quickly, rinses freely and completely, and leaves no streaky residue. Stoner SS1 produces a pleasant banana scent throughout the wash bay. Stoner SS1 may be applied at high or low pressure and may be used with hot water to increase performance qualities. Stoner SS1's low viscosity formula facilitates consistent and reliable spraying, pumping, and metering. Super concentrated for economy and cost effectiveness. Hard water tolerant. Contains no phosphates, caustics, or acids. Contains no silicone wetting agents. Safe for clear coat finishes when used as directed. Stoner SS1 Shine & Sealant is concentrated for dilution with water only. When used directly from the container set final dilution controls to 1:500 (SS1:water). To predilute, mix one part concentrate with 3 parts water and set final dilution at 1:125. Test mixture and adjust dilution, if necessary, for desired thickness and cleaning strength.